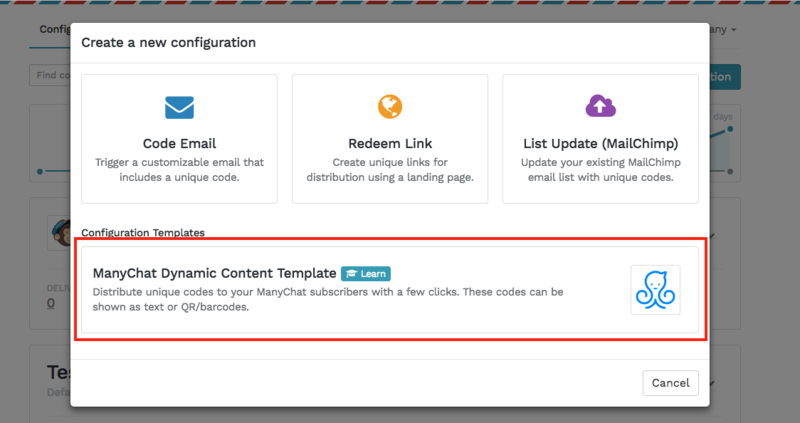 You can use Coupon Carrier to distribute your unique codes, either as text or as QR/Barcodes, to your ManyChat subscribers using their new Dynamic Content Block. This block can be added to any ManyChat message. You can choose to upload your own set of unique codes, or you can generate new codes automatically from supported integrations like Shopify and WooCommerce. In this example, we'll be creating a new Broadcast in ManyChat what will send a unique code to each subscriber that receives it. 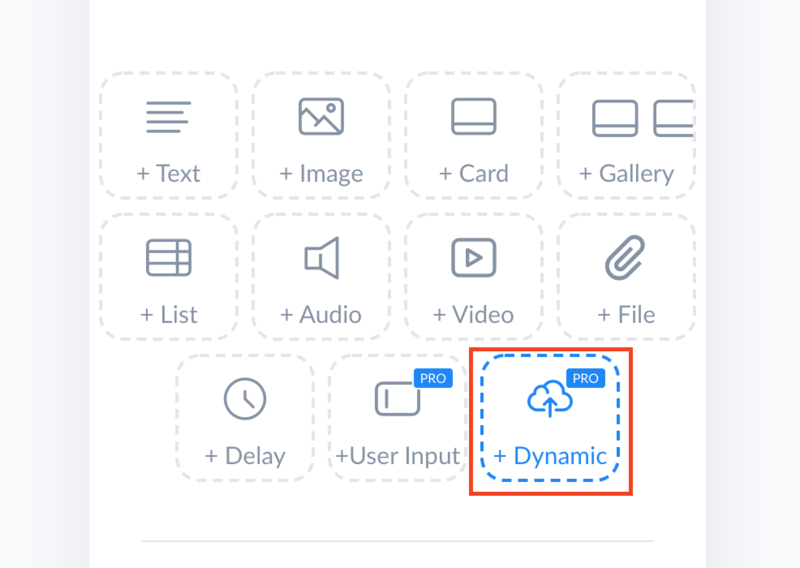 From the main configurations tab in Coupon Carrier, create a new configuration using the "Create a New Configuration" button at the top right and then choose the "ManyChat Dynamic Content Template". Depending on what kind of code/coupon you're sending to your subscribers, you might want to display the code as plain text or as a QR/barcode. You can choose which option that fits your needs. The QR/barcode option allows you to select which type of barcode you'd like to create, and also a few different sizes. If you have a list of unique codes you can import these into a Code List and then choose to use that as the source for your configuration. 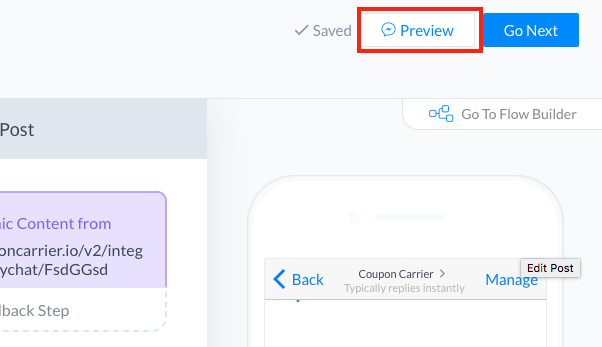 When a code is requested from ManyChat, Coupon Carrier will pick the next available code from the list. All new accounts will have a small sample code list that you can use for testing. You can also create Autogenerated Code Lists. These lists are dynamic and can be connected to integrations like Shopify/WooCommerce. These Code Lists will automatically create codes when requested according to the settings. Read more about Autogenerated Code Lists. Finally, save your changes and choose to activate the configuration when asked. You can also activate/pause the configuration using the toggle switch on the main configuration list. Once activated, the custom link shown at the top will be active. In the next step, we'll use that link in ManyChat to get the unique codes. Login to your ManyChat account and create a new Broadcast message (Broadcasting > New Broadcast). Next, add a new Dynamic Content block. If this isn't available, check that you have enabled the DevTools under the account settings. Request Type should be set to "POST". On the "Body" tab, click the "[+] Add a Variable" link and choose "User Id". This will ensure that the unique User Id is passed along to Coupon Carrier. To test the link, click "Test the request" located at the top right. You should see a successful response if everything is configured correctly. Any error messages will be shown as the result. Save the settings and then use the Preview feature of ManyChat to preview the message. This will send the message to you on Messenger.